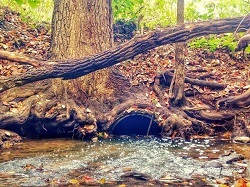 The New York State Department of Environmental Conservation (DEC) is now accepting applications for projects that help communities in the Hudson River estuary watershed replace or right-size culverts and bridges, or remove dams to better cope with flood events, protect water quality, and restore aquatic habitat connectivity for migratory fish and other species of concern in tributary streams of the estuary. To be eligible for this funding, projects must conserve and restore aquatic habitat connectivity for Species of Greatest Conservation Need (SGCN) found in the tributary streams of the Hudson River estuary watershed, particularly river herring, American eel, and brook trout. The grants are also intended to help communities with existing and projected impacts of localized flooding along tributaries of the estuary. Projects that accomplish both habitat and local flood risk-reduction objectives are desired. A map of identified and prioritized barriers can be viewed at www.dec.ny.gov/lands/99489.html. The grants are provided through the Environmental Protection Fund, the Natural Resource Damages Fund, and the U.S. Fish and Wildlife Service's State Wildlife Grant and are administered under DEC’s Hudson River Estuary Program. The Request for Applications (RFA) for Tributary Restoration and Resiliency is available on the New York State Grants Gateway. The Grants Gateway is a web-based grants-management system that streamlines the way grants are administered by the State of New York. Search for "Hudson River Estuary"and click on the link for "Reissue: 2015 Hudson River Estuary Grants for Tributary Restoration and Resiliency". For more information please visit the DEC web page Grants Program for the Hudson River Estuary.